SPISim’s products are activated via internet. License file is generated and retrieved for each pair of activation code and computer ID. Computer ID is an unique string calculated based on your computer’s hardware and software configuration. It is unique for each computer and user on a particular OS. What is my computer ID? You may find our your computer ID on line or via installed SPISim tool. To check ID from the tool, from main menu: “Help”->”Activate License”. Please double click the ComputerID field shown below to “copy-N-paste” if needed. This will avoid possible error caused by typing this ID manually. You may see where your license files are stored from main menu: “Help”->”Activate License”. Please double click the Computer ID field shown below to “copy-N-paste” if needed. Please also make sure proxy and port are also set properly if you are behind a firewall. 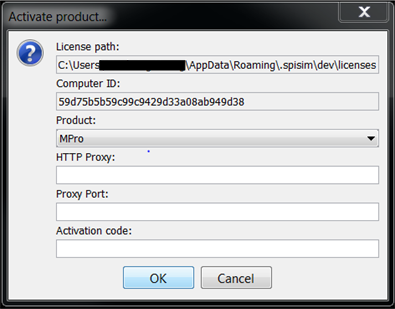 SPISim will send you full/free-trial activation code within 24 hours upon request is received. Please keep a record of your computer ID or company email used for registration after activation. This is particular important if you purchase more than one licenses using same user name. You will need to provide this ID and/or username/email to move license(s) to other computer(s).